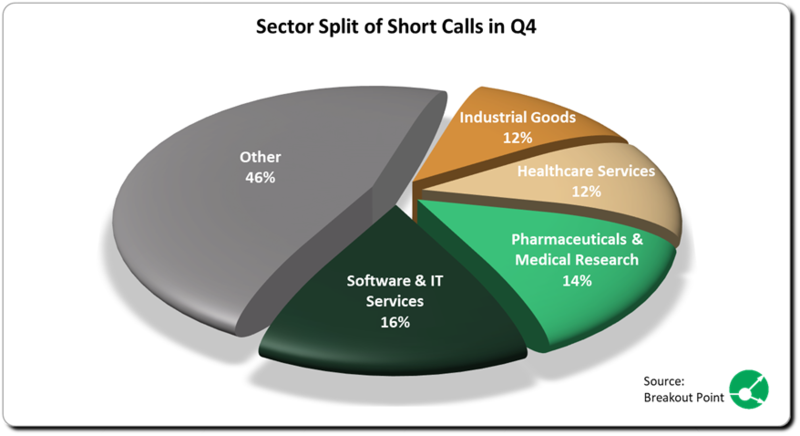 So far, in Q4 we have tracked 43 new major short calls and activist short reports. For comparison, we recorded: 34 major shorts in Q1; 40 in Q2 and 25 in Q3. 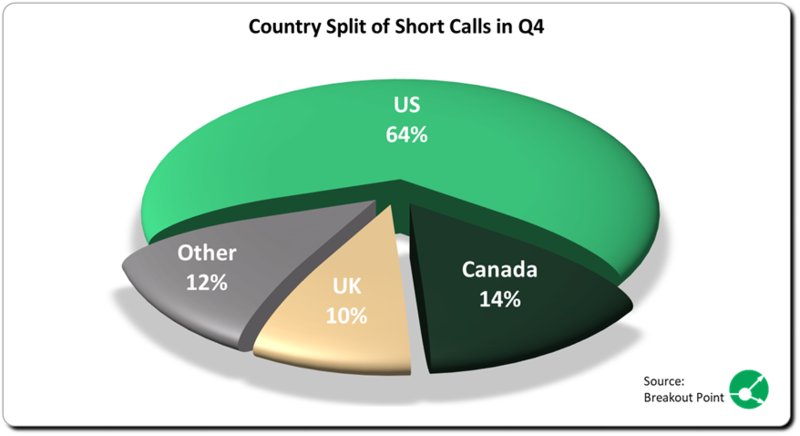 Notably, about one third of new Q4 short calls has been announced on a single day (2018-12-03), during Kase Learning Shorting Conference. On average, stocks targeted in Q4 are down about 23%, while S&P is down about 17% in Q4. Activist short sellers’ targets that were announced in Q1-Q3 lost about 27% on average, which might partly be due to much longer observation period. About two thirds of targeted companies were US companies. On average, US targets went down 20%, while Canadian and UK targets lost much more – about 35%. Companies from Software and IT Services sector were subject of 7 short calls. The results of shorting in this sector were mixed: First Derivatives plc (ShadowFall’s short) and Momo Inc (J Capital’s short) dropped about 48% and 29%, respectively, while Pinduoduo (Blue Orca’s short) is up about 23% and is by far the best performing stock of all targeted stocks. Six stocks from Pharmaceuticals, Biotech and Medical Research sector were targeted in Q4. They are on average down 44%. This represents the highest drop among all considered sectors. In terms of % drop, Q4's top short call is White Diamond’s Namaste Technologies call. The stock lost about 70% since this report. White Diamond mentioned in their report major related-party transactions that go beyond findings of Citron's Namaste report in Q3. White Diamond had a very successful year on the short side and, according to our records, their 10 short calls from 2018 have lost 57% on average. The only short among Top 10 that already reached corresponding target price is Kier Group short. This short was presented by Kuvari Partners at the 2018 Sohn London Idea Conference and, interestingly, was the only short idea presented at Sohn. Kier has been subject of considerable short selling by a number of hedge funds (more about that is available here: “Kuvari's Kier Group Short -50%”). They currently hold only two more big shorts (shorts >0.5%) in whole of EU, a short in a company from Construction & Engineering sector and a short in a company from IT Services & Consulting sector. Hindenburg Research is the only activist that appears twice on Top 10 list. They are a relatively new player in short activism space and have started publishing in 2017. According to our records, their last 10 short calls have experienced an average drop of about 28%. Note that joint Aphria short report by Hindenburg and QCM is listed as two separated calls in our Top 10 list. Aphria has experienced considerable price movements following the short report. It initially dropped as much as 50% following short report and bounced somewhat since. Also, a lot of 3rd party commentary came out, such as positive mention by Citron Research, while anticipated line-by-line rebuttal of Aphria is not out as of time of writing this post. Two short calls from above list were first presented during Kase Learning Shorting Conference. Average loss of a short from Tilson’s conference is about 20%. Newcomer, Plainview had their first short report on 2018-10-01 and, a biotechnology company, Nektar Therapeutics, that was targeted on basis of drug efficiency concerns, is down about 50%. Twitter has lost about 17% since close on 2018-12-19. One of the contributors for the drop has been Citron’s follow-up report on 2018-12-20. 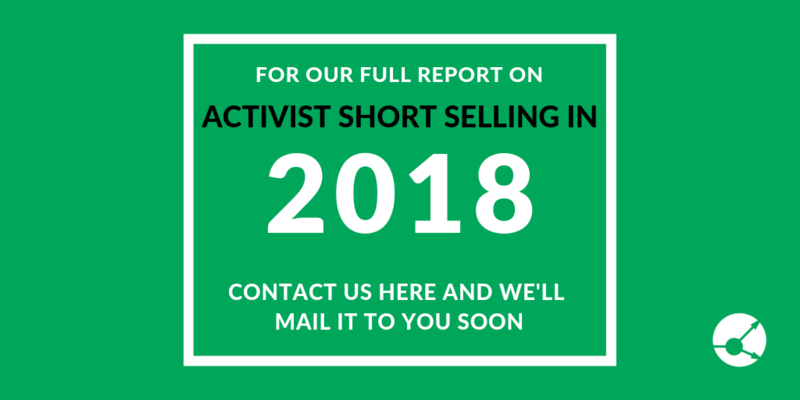 MiMedx has been subject of several short reports by several prominent activist short sellers (Viceroy Research, Aurelius, Marc Cohodes and Citron Research), about 15 months ago and recently got delisted from NASDAQ. * Note: Presented data is as of close on 2018-12-21.